Poly(ADP-ribose) polymerases (PARPs) are a family of enzymes that synthesise ADP-ribosylation (ADPr), a reversible modification of proteins that regulates many different cellular processes. Several mammalian PARPs are known to regulate the DNA damage response, but it is not clear which amino acids in proteins are the primary ADPr targets. Previously, we reported that ARH3 reverses the newly discovered type of ADPr (ADPr on serine residues; Ser-ADPr) and developed tools to analyse this modification (Fontana et al., 2017). Here, we show that Ser-ADPr represents the major fraction of ADPr synthesised after DNA damage in mammalian cells and that globally Ser-ADPr is dependent on HPF1, PARP1 and ARH3. In the absence of HPF1, glutamate/aspartate becomes the main target residues for ADPr. Furthermore, we describe a method for site-specific validation of serine ADP-ribosylated substrates in cells. Our study establishes serine as the primary form of ADPr in DNA damage signalling. ADP-ribosylation (ADPr) is a reversible evolutionarily conserved posttranslational modification of proteins, which controls many critical cellular processes (Palazzo et al., 2017a; Lüscher et al., 2018). Poly(ADP-ribose) polymerases (PARPs) compose the major family of enzymes that catalyse the transfer of ADP-ribose unit(s) from NAD+ to protein substrates (Barkauskaite et al., 2015; Gupte et al., 2017). Seventeen members of the PARP superfamily are encoded within the human genome, which are characterized by distinct structural domains, activities and involvement in a variety of cellular processes, including the DNA damage response (DDR) (Gupte et al., 2017). PARPs directly involved in DNA repair are PARP1, PARP2, and PARP3 (Langelier and Pascal, 2013; Martin-Hernandez et al., 2017). While PARP3 can attach only a single ADP-ribose unit on target proteins (MARylation) (Vyas et al., 2014), PARP1 and PARP2 can extend the initial ADPr event into long chains that remain attached on the proteins (Poly(ADP-ribosyl)ation, PARylation) (D'Amours et al., 1999). PARP-dependent ADPr of these proteins is induced by binding of PARPs to DNA breaks, which produces timely and localised ADPr signals that control appropriate DDR mechanisms (Langelier et al., 2014). PARPs have previously been described to mainly target acidic residues (glutamates and aspartates; Glu and Asp, respectively) in proteins (Gagné et al., 2015; Daniels et al., 2015; Martello et al., 2016; Crawford et al., 2018). However, we recently showed that serine (Ser) residues are also targets for PARP-dependent protein modification (Leidecker et al., 2016; Crawford et al., 2018) and that Ser ADP-ribosylation (Ser-ADPr) is involved in processes underlying genome stability and the DDR, in particular (Bonfiglio et al., 2017a). Furthermore, we showed that the DNA damage responsive protein Histone PARylation Factor-1 (HPF1/C4orf27) forms complexes with either PARP1 or PARP2 (Gibbs-Seymour et al., 2016) and promotes the synthesis of Ser-ADPr on a variety of protein substrates (Bonfiglio et al., 2017a). Finally, we discovered ARH3/ADPRHL2 as a hydrolase responsible for the specific reversal of Ser-ADPr in cells (Fontana et al., 2017). Our previous observations suggested that Ser-ADPr is a widespread form of ADPr in cells (Fontana et al., 2017; Bonfiglio et al., 2017a). Here, by using a combination of biochemical and cell biology approaches, we demonstrate that the bulk of ADPr synthesised in cultured mammalian cells is strictly dependent on HPF1 and that Ser-ADPr represents the most abundant form of ADPr after DNA damage in these cells. ADPr of proteins rapidly occurs to recruit and control activities of many crucial proteins involved in the repair of damaged DNA (Martin-Hernandez et al., 2017). The study of ADPr has been significantly hampered by technical limitations, such as the barriers to visualize all forms of cellular ADPr and the challenges in proteomics analyses (Vivelo and Leung, 2015; Bonfiglio et al., 2017b). For example, until recently, only anti-PAR antibodies have been available, which can detect only the long PAR chains. However, recently a reagent specific for ADPr of any length (referred here as a pan-ADPr antibody) as well as a reagent specific for mono-ADPr have been developed (Gibson et al., 2017) and allowed us to follow protein ADPr events in cells upon DNA damage. We first exposed human osteosarcoma U2OS to the DNA damaging agent hydrogen peroxide (H2O2) and compared the ADPr pattern of control, ARH3 knock-out (KO), HPF1 KO and PARP1 KO cells (Figure 1A). In control cells, pan-ADPr signals after DNA damage revealed a number of modified proteins in the extract. The most easily identifiable signals relate to the modification of histone proteins as well as PARP automodification (Figure 1A). Both signals can also be recognised by the reagent that is specific for MARylation (referred here as a mono-ADPr antibody; Figure 1A) (Gibson et al., 2017). 2 hr after DNA damage the global ADPr signal is reduced to the levels comparable to untreated cells. However, importantly, the DNA damage-inducible ADPr is prevented in HPF1-depleted cells (Figure 1A), as we observed previously for specific histone substrates (Bonfiglio et al., 2017a). An exception is the auto-modification of PARP1 that is characterized by relatively longer ADPr chains (although also at overall lower levels) when compared to control cells (Figure 1A), as noted previously (Gibbs-Seymour et al., 2016). Expectedly, most of the global ADPr signal was abolished in PARP1 KO cells, as we showed previously for histone Ser-ADPr marks (Bonfiglio et al., 2017a), confirming that PARP1 is the most active PARP involved in DDR (Figure 1A). In order to investigate whether the global pan-ADPr is truly dependent on HPF1, we tested two independent clones of HPF1 KO cells and observed comparable results with both cell lines (Figure 1B). These data suggest that global ADPr in response to DNA damage requires both HPF1 and PARP1. HPF1-dependent Ser-ADPr is the major form of ADPr upon genotoxic stress. (A) Control, ARH3 KO (ARH3−/−), HPF1 KO (HPF1−/−), and PARP1 KO (PARP1−/−) U2OS cells were treated with 2 mM H2O2. 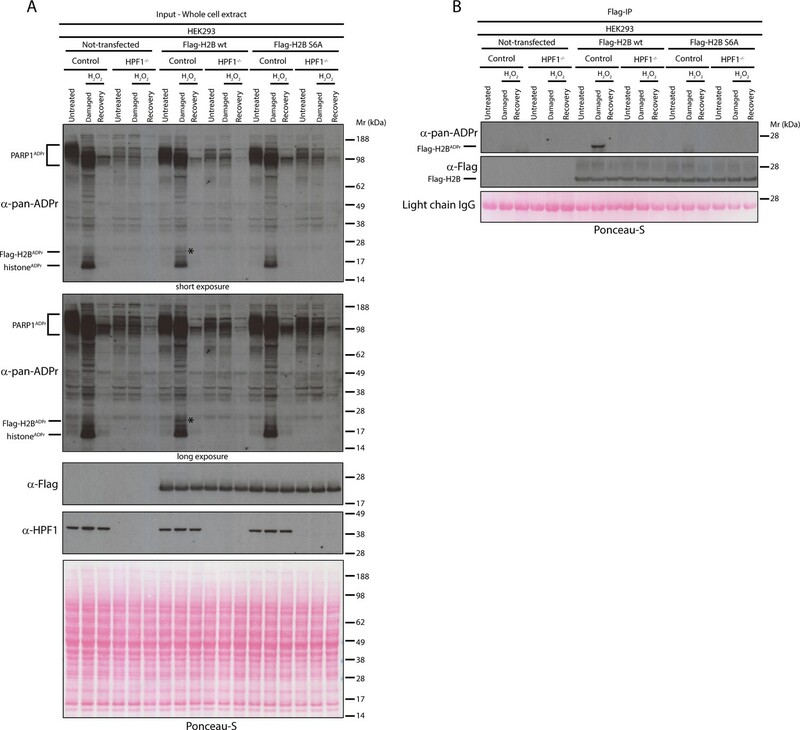 After treatment/recovery, cells were lysed and proteins were separated by SDS-PAGE, analysed by western blot and probed for pan-ADPr, mono-ADPr, PAR, PARP1, ARH3, H3, and HPF1 antibodies. Additionally, Ponceau-S staining was used as loading control. (B) Control, ARH3 KO (ARH3−/−) and two independent clones of HPF1 KO (HPF1−/−−1 and HPF1−/−−2) U2OS cells were treated with 2 mM H2O2. 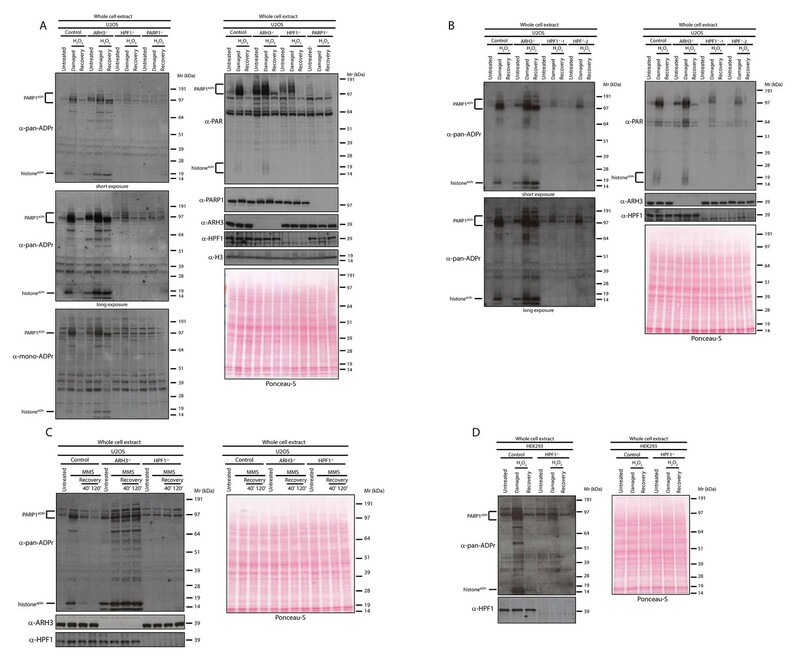 After treatment/recovery, cells were lysed and proteins were separated by SDS-PAGE, analysed by western blot and probed for pan-ADPr, PAR, ARH3, and HPF1 antibodies. Ponceau-S staining was used as loading control. (C) Control, ARH3 KO (ARH3−/−), and HPF1 KO (HPF1−/−) U2OS cells were treated with 2 mM MMS. After the induction of DNA damage, the cells were left to recover from genotoxic stress for the indicated time points. 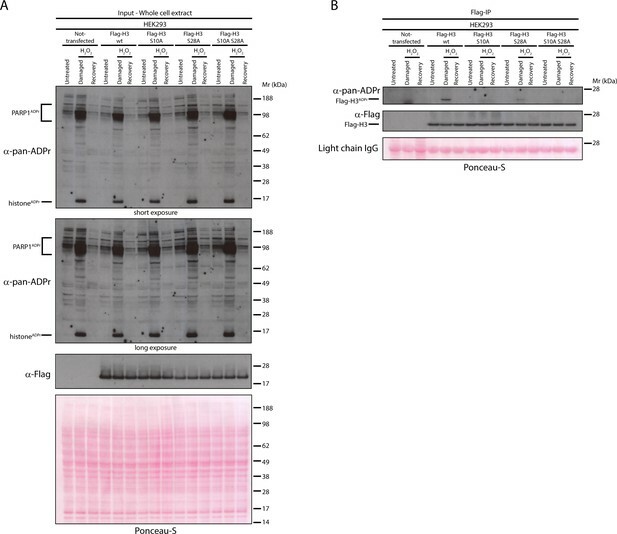 After treatment/recovery, cells were lysed and proteins were separated by SDS-PAGE, analysed by western blot and probed for pan-ADPr, ARH3, and HPF1 antibodies. Ponceau-S staining was used as loading control. (D) Control and HPF1 KO (HPF1−/−) HEK293 cells were treated with 2 mM H2O2. 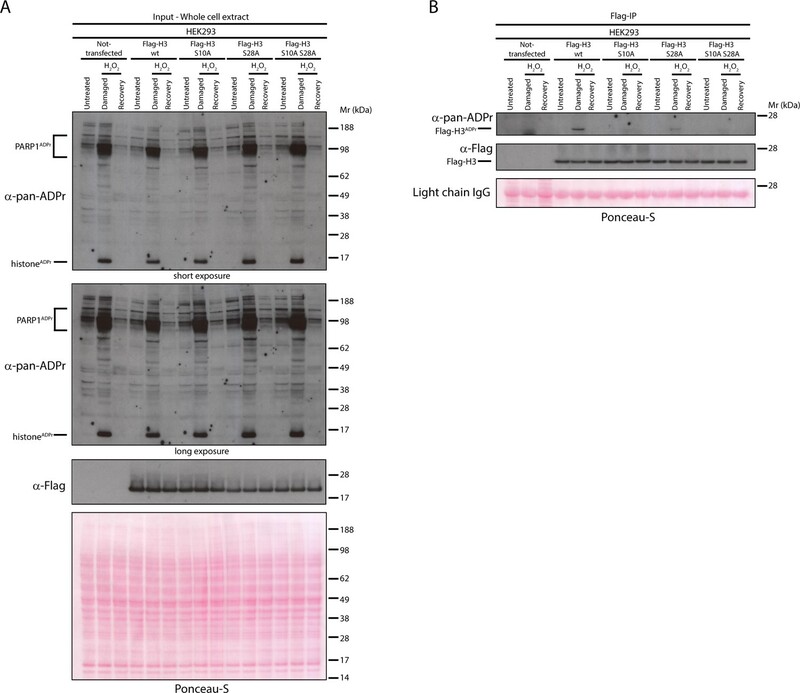 After treatment/recovery, cells were lysed and proteins were separated by SDS-PAGE, analysed by western blot and probed for pan-ADPr, ARH3, and HPF1 antibodies. Ponceau-S staining was used as loading control. As observed in our previous study (Fontana et al., 2017), ARH3 KO cells already showed notably higher levels of ADPr proteins under unstimulated conditions when compared to control cells (Figure 1A–B). However, the difference in ADPr signal upon DNA damage was much more pronounced and allowed detection of a number of additional ADP-ribosylated protein bands in ARH3-deficient extracts that persisted for at least 2 hr. This was especially obvious for histone ADPr detected by the pan-ADPr reagent (Figure 1A–B). Next, we used another DNA damaging agent, the alkylating agent methyl methanesulfonate (MMS). U2OS cells were treated with MMS, and then their recovery was analysed at 40’ and 120’ time points. Consistent with the observations for H2O2 treatment, most of the ADPr signal was HPF1-dependent and persisted in ARH3-deficient cells (Figure 1C). In order to validate our observations in other cellular models, we next tested the human embryonic kidney (HEK) 293 cells. To confirm whether ADPr is HPF1-dependent in these cells, we challenged wild type and HPF1-depleted HEK293 cells with H2O2 (Figure 1D). Notably, HEK293 cells showed a number of ADP-ribosylated proteins detected by pan-ADPr antibody and modifications of most of these proteins were strictly dependent on HPF1 protein (Figure 1D). The dependence of ADPr regulation on HPF1 and ARH3 suggests that Ser-ADPr is the dominant form of ADPr upon DNA damage. This is consistent with the data from recent proteomic analyses capable of detecting Ser-ADPr (Leidecker et al., 2016; Bonfiglio et al., 2017a; Bilan et al., 2017). However, proteomics studies based on hydroxylamine, which excludes ADPr mapping on residues other than the Glu and Asp (Moss et al., 1983; Daniels et al., 2015), showed that modification of these residues is widespread in DDR (Zhang et al., 2013; Gibson et al., 2017; Zhen et al., 2017). We reasoned that hydroxylamine could allow a direct and simple estimate of the abundance of the modification on Glu/Asp in the context of the global ADPr. Importantly, using defined substrates for both Ser-ADPr (Bonfiglio et al., 2017a; Fontana et al., 2017) and Glu/Asp-ADPr (Sharifi et al., 2013), we showed by autoradiography that hydroxylamine does not remove ADPr from Ser residues (Figure 2A) while confirming the complete removal of ADPr from Glu/Asp (Figure 2B). Considering the above data (Figure 1) and previous studies (Bilan et al., 2017; Leidecker et al., 2016; Bonfiglio et al., 2017a; Fontana et al., 2017) that imply the predominance of Ser-ADPr upon DNA damage, we hypothesized that the loss of signal after hydroxylamine treatment would be minor in wild type cells. To test this, we incubated hydroxylamine with proteins extracted under denaturing conditions from both control (Figure 2C) and H2O2–treated (Figure 2D) cells and monitored the ADPr signal with the anti-pan-ADPr and anti-PAR antibodies. We observed no noticeable loss of either the global ADPr or PARylation signal in DNA-damaged cells (Figure 2D) and only a moderate reduction in untreated cells (Figure 2C), indicating that under these conditions Glu/Asp-ADPr is not abundant. In contrast, intriguingly, hydroxylamine completely abolished both the global ADPr and PAR signals on proteins extracted from HPF1 KO cells (Figure 2C–D), implying that in the absence of HPF1 virtually all the ADPr is on acidic residues. This cellular finding is in accordance with the well-established biochemical evidence that Asp and Glu are the prevalent target residues when in vitro ADPr reactions are performed without HPF1 (Tao et al., 2009; Sharifi et al., 2013; Bonfiglio et al., 2017a). HPF1-dependent ADPr is resistant to hydroxylamine. (A) Autoradiogram shows serine ADPr of two synthetic peptides (wild type (WT) or Ser10Ala (S10A) mutant) corresponding to amino acids 1–21 of human H3 by wild type PARP1 or PARP1 E988Q in the presence of HPF1, with or without treatment with 1M NH2OH (hydroxylamine). Imperial Blu staining was used to show equal loading of samples. (B) Autoradiogram shows auto-ADPr of PARP1 E988Q (at glutamate residues) and the effect of the treatment with 1M NH2OH. Imperial Blue staining was used to show equal loading of samples. (C) Whole cell extracts were prepared from pre-damaged U2OS wild type or HPF1 KO (HPF1−/−) cells. Extracts were either left untreated or treated with 1M hydroxylamine (NH2OH) for 3 hr prior to separation on SDS-PAGE gel and immunoblotting with pan-ADPr, PAR or HPF1 antibodies. Ponceau-S staining was used as loading control. (D) Whole cell extracts were prepared from U2OS wild type or HPF1 KO (HPF1−/−) cells following treatment with 2 mM H2O2 for 10’. Extracts were either left untreated or treated with 1M hydroxylamine (NH2OH) for 3 hr prior to separation on SDS-PAGE gel and immunoblotting with pan-ADPr, PAR, H3 or HPF1 antibodies. Ponceau-S staining was used as loading control. The above experiments demonstrate the abundance of Ser-ADPr by monitoring global ADPr level (Figure 1). To investigate this on a specific substrate, we analysed the level of Ser-ADPr on histone H2B. In our previous studies, we identified by mass spectrometry ADPr of H2B exclusively on Ser residues (Leidecker et al., 2016) and showed that this modification is highly dependent on HPF1 in cells (Bonfiglio et al., 2017a). Here, we set to investigate whether Ser-ADPr is the primary form of ADPr on histone H2B. To test this, we generated mammalian expression constructs where H2B was tagged with the Flag epitope as well as a version of Flag-tagged H2B where the main candidate ADPr site, Ser6 was mutated to alanine (S6A). Both wild type and S6A Flag-tagged H2B constructs were transiently transfected into control and HPF1-depleted HEK293 cells. Whilst the Flag-tagged wild type H2B was efficiently ADP-ribosylated upon H2O2 treatment in control cells, the H2B ADPr signal was completely abolished in HPF1 KO HEK293 cells, as shown in both whole cell extracts and Flag-immunoprecipitations (IP) (Figure 3A–B, respectively). In addition, the S6A mutant did not show any ADPr in both control and HPF1-depleted cells. These data demonstrate that Ser residue at position six is the main acceptor site of ADPr on H2B (Leidecker et al., 2016) and confirm that this Ser-ADPr is HPF1-dependent (Bonfiglio et al., 2017a). Serine six is the main ADPr site of histone H2B induced by DNA damage. (A) Control and HPF1 KO (HPF1−/−) HEK293 cells were transfected or not with Flag-H2B wild type (wt) and Flag-H2B Ser6Ala mutant construct (S6A). 24 hr post-transfection, cells were treated with 2 mM H2O2. 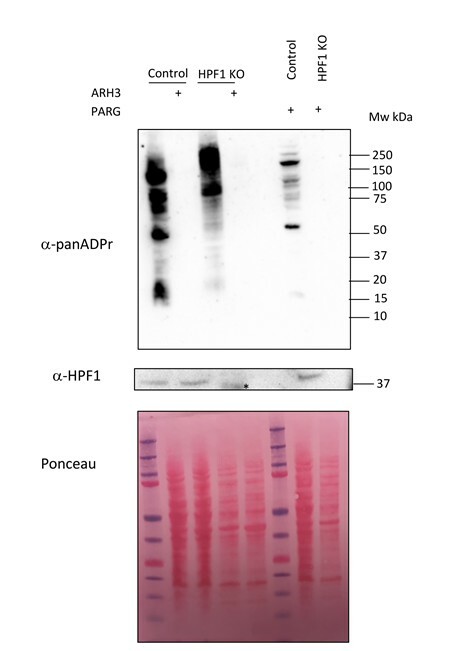 After treatment/recovery, cells were lysed and proteins were separated by SDS-PAGE, analysed by western blot and probed for pan-ADPr, Flag, and HPF1 antibodies. Ponceau-S staining was used as loading control. The black star marks the ADP-ribosylated Flag-tagged H2B protein in the whole cell wild type extract, which is absent in other extracts. (B) Flag-tagged H2B wild type (wt) and Ser6Ala mutant (S6A) were immunoprecipitated (IP) by using anti-Flag antibody from the lysates generated in Figure 3A. IPs were separated by SDS-PAGE, analysed by western blot and probed for pan-ADPr and Flag antibodies. Ponceau-S staining was used to stain light chains of Immunoglobulins (IgG) as loading control of the IP. Next, we used the same approach to confirm the main in vivo ADPr sites on histone H3. In our previous study, we detected H3 ADPr sites in cells on Ser10 and Ser28 (Leidecker et al., 2016), so we prepared the constructs for the expression of the Flag-tagged H3 wild type protein, the H3 alanine mutants at Ser10 (S10A) and Ser28 (S28A), as well as the double mutant (S10A S28A). Flag-IP of the Flag-tagged proteins expressed in HEK293 cells and subsequent western blot against pan-ADPr revealed that the mutation of both Ser10 and Ser28 on H3 abolishes the DNA damage-induced H3 ADPr (Figure 4). Furthermore, we observed that in our conditions ADPr predominantly happens on the Ser10 site, while the mutation of Ser28 showed a small, but significant reduction of ADPr. In conclusion, the expression of wild type and Ser-ADPr mutants in HEK293 cells by this simple approach should allow the validation of Ser-ADPr sites for many other ADP-ribosylated candidate proteins involved in the DDR. Serine 10 and serine 28 are the main ADPr sites of histone H3 induced by DNA damage. (A) HEK293 cells were transfected or not with Flag-H3.1 (Flag-H3) wild type (wt), Flag-H3.1 Ser10Ala (S10A), Flag-H3.1 Ser28Ala (S28A), and Flag-H3.1 Ser10Ala Ser28Ala double mutant (S10A S28A) constructs. 24 hr post-transfection, cells were treated with 2 mM H2O2. After treatment/recovery, cells were lysed and proteins were separated by SDS-PAGE, analysed by western blot and probed for pan-ADPr and Flag antibodies. Ponceau-S staining was used as loading control. (B) Flag-tagged H3.1 (Flag-H3) wild type (wt), Ser10Ala (S10A), Ser28Ala (S28A), and Ser10Ala Ser28Ala double mutants (S10A S28A) were immunoprecipitated (IP) by using anti-Flag antibody from the lysates generated in Figure 4A. IPs were separated by SDS-PAGE, analysed by western blot and probed for pan-ADPr and Flag antibodies. Ponceau-S staining was used to stain light chains of immunoglobulins (IgG) as loading control of the IP. ADPr is unique among posttranslational modifications for its exceptional chemical versatility in modifying a variety of substrate amino acids (Daniels et al., 2015). Glu, Asp, Lys, Arg and Ser have been indicated as the major ADPr target residues by recent proteomics studies, some of which, however, employ sub-optimal approaches that may lead to misassignment of ADPr specificities (Bonfiglio et al., 2017b). Thus, the attention is currently shifting from mere identification of ADPr sites to the elucidation of the biological pathways in which a form of ADPr plays a major role (Gupte et al., 2017). Our discovery of Ser-ADPr in 2016 has fuelled the rapid progress in the field, which has already resulted in the identification of the ‘eraser’ of Ser-ADPr (Fontana et al., 2017). Our computational reanalysis (Matic et al., 2012) of a published ADPr dataset (Martello et al., 2016); ProteomeXchange ID: PXD004245) showed that Ser-ADPr is a widespread modification (Bonfiglio et al., 2017a). This has stimulated the current study, in which we address the abundance of Ser-ADPr in cells. Our findings show that in endogenous wild type cells Ser-ADPr is the primary form of ADPr upon DNA damage. This is consistent with the data from an independent study, in which an unbiased proteomics technology (Bonfiglio et al., 2017b) showed that the vast majority of ADPr localises on Ser residues (Bilan et al., 2017). Importantly, our data indicate that Asp and Glu are the main targets of ADPr in PARP1-dependent, but HPF1-independent DNA damage signalling. This extends the concept of the ‘switching’ of PARP1 amino acid specificity (Bonfiglio et al., 2017a; Leung, 2017) to the cellular context. Future studies are needed to unravel the physiological and pathological conditions controlled by Ser-ADPr and Asp/Glu-ADPr. In conclusion, the discovery of Ser-ADPr as well as the recent discoveries of reversible ADPr of DNA (Jankevicius et al., 2016; Talhaoui et al., 2016; Munnur and Ahel, 2017; Dölle and Ziegler, 2017) have added considerable depth to our understanding of the function and versatility of ADPr signalling in the cell, and raise the possibility that there may be other unique cellular and molecular processes regulated by ADPr. Anti-PAR polyclonal antibody (4336-BPC-100, RRID:AB_2721257; rabbit) was purchased from Trevigen (Gaithersburg, MD﻿, ﻿U﻿S﻿) and used at 1:1000 dilutions. Monoclonal anti-pan-ADPr (MABE1016, RRID:AB_2665466), monoclonal anti-mono-ADPr (MABE1076, RRID:AB_2665469) and polyclonal anti-histone H3 (07–690, RRID:AB_417398) rabbit antibodies were purchased from Millipore (Billerica, MA, US﻿) and used at 1:1500, 1:1000 and 1:2000 dilutions, respectively. Rabbit polyclonal anti-ARH3/ADPRHL2 (HPA027104, RRID:AB_10601330) was purchased from Atlas Antibodies (Stockholm, Sweden) and used at 1:1000 dilution. Rabbit monoclonal anti-PARP1 (ab32138, RRID:AB_777101) was purchased from Abcam (Cambridge, UK) and used at 1:1000 dilution. Custom-made rabbit polyclonal HPF1 antibody was used as described (1:1000) (Gibbs-Seymour et al., 2016). Anti-Flag M2 agarose affinity gel (A2220, RRID:AB_10063035) and anti-Flag HRP-conjugated (A8592, RRID:AB_439702; used at 1:5000 dilution) mouse monoclonal antibodies were purchased from Sigma-Aldrich (St. Louis, MO, US). Immunoblots were performed as previously described (Fontana et al., 2017). Human U2OS osteosarcoma (ATCC HTB-96, RRID:CVCL_0042) and HEK293 (ATCC CRL-3216, RRID:CVCL_0063) cells were acquired from ATCC, identity was confirmed by STR profiling, and absence of mycoplasma contamination confirmed by MycoAlert Mycoplasma Detection Kit. Cells were cultured as previously described (Fontana et al., 2017). Generation of KO cell lines was previously described (Gibbs-Seymour et al., 2016; Fontana et al., 2017). Full-length human histones H2B and H3.1 cDNA were cloned into the pDONR221 vector (Thermo Fisher Scientific; Waltham, MA, US). Ser to Ala point mutations were produced in pDONR221-H2B and pDONR-H3.1 by site directed mutagenesis. Mammalian expression constructs expressed H2B and H3.1 proteins with the C-terminal 3xFlag tag. Transient DNA transfections in HEK293 cells were performed with Polyfect (QIAGEN; Venlo, Netherlands) for 24 hr. For MMS treatment, cells were damaged with 2 mM MMS (Sigma-Aldrich; St. Louis, MO, US) for 1 hr. In case of H2O2, cells were damaged with 2 mM H2O2 (Sigma-Aldrich; St. Louis, MO, US) for 10 min. Cells were lysed as previously described (Fontana et al., 2017) in the following buffer: 50 mM Tris-HCl pH 8.0, 100 mM NaCl, and 1% Triton X-100. Immediately before lysing the cells, the lysis buffer was supplemented with 5 mM MgCl2, 1 mM DTT, proteases and phosphatases inhibitors (Roche; Basel, Switzerland), 1 μM ADP-HPD (Calbiochem, La Jolla, CA), and 1 μM Olaparib (Cayman Chemical, Ann Arbor, MI). After the cell pellet was resuspended in the supplemented lysis buffer, Benzonase (Sigma-Aldrich; St. Louis, MO, US) was added (Fontana et al., 2017). Cell pellets were resuspended in SDS lysis buffer (10 mM HEPES pH 8.0, 2 mM MgCl2, 1% SDS, 250 U Universal Nuclease (Pierce; Waltham, MA, US), 1 x protease inhibitor (Roche; Basel, Switzerland) and briefly sonicated. BCA assay (Pierce; Waltham, MA, US) was used to determine the protein concentration. 30 µg damaged or 50 µg non-damaged cell were treated with 1 M NH2OH (hydroxylamine; Sigma-Aldrich; St. Louis, MO, US) for 3 hr at room temperature or left untreated. After the treatment, extracts were neutralized with 0.3% HCl and mixed with 4x SDS Loading buffer (Invitrogen; Calrsbad, CA, US) containing 100 mM DTT, followed by immunoblotting as described above. In vitro ADP-ribosylation reactions were performed as previously described (Bonfiglio et al., 2017a; Palazzo et al., 2017b). Reactions were stopped by Olaparib (2 μM final concentration) and then incubated with or without 1 M NH2OH for 3 hr before being detected by autoradiography. The molarity of HPF1 proteins used in the reactions were 1 μM, PARP1 was 0.1 μM and PARP1 E988Q 4 μM. The synthetic H3 peptide substrates were 3 μg per condition. Critical Reviews in Biochemistry and Molecular Biology 53:64–82. The Biochemical Journal 342 (Pt 2):249–268. Current Opinion in Structural Biology 23:134–143. Seminars in Cell & Developmental Biology 63:92–101. The Journal of Biological Chemistry 258:6466–6470. Methods in Molecular Biology 1608:415–430. Journal of the American Chemical Society 131:14258–14260. Thank you for submitting your article "Serine is the major residue for ADP-ribosylation upon DNA damage" for consideration by eLife. Your article has been reviewed by three peer reviewers, and the evaluation has been overseen by a Reviewing Editor and Ivan Dikic as the Senior Editor. The reviewers have opted to remain anonymous. This manuscript provides compelling data that supports ADP-ribosylation of serine residues as the major outcome of PARP1 activity during the DNA damage response. 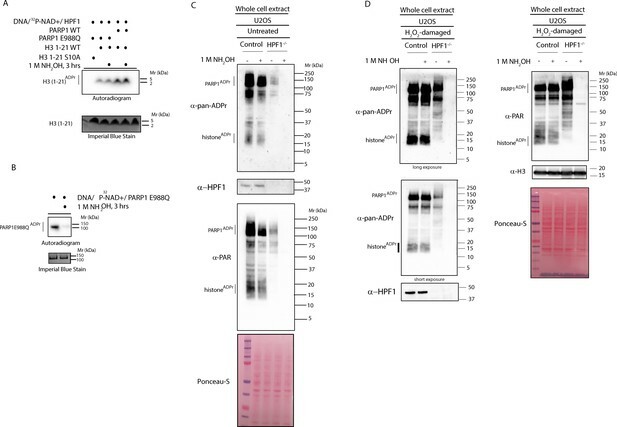 The paper will serve as a nice addition to the previously published paper identifying ARH3 as the enzyme that reverses the Ser-ADPr modification. The current study is important because it will highlight the prevalence of the serine modification during the DNA damage response, and could lead the field to re-focus on this type of modification, rather than just the Glu/Asp modification. In that regard, this is a valuable contribution to the literature and is worth publishing. There are few experiments that need to be conducted. 1) The authors state that the major fraction of ADP-ribosylation occurs on serines after DNA damage. To substantiate the findings in Figure 3 that shows HPF1-dependent serine ADP-ribosylation of H2B, the authors should test whether knockout of HPF1 indeed abolishes serine 6 ADP ribosylation in vivo using MS. To what extent does Glu/Asp become the main ADP-ribose acceptors in the absence of HPF1? H2B does not appear to become ADP-ribosylated at all in the absence of HPF1, while PARP1 does. Is there any unbiased study addressing this switch in target residues? 2) Is serine-ADP ribosylation of other histones or additional main targets previously reported by authors such as HMGA1, HMGB1, HMGN1, NPM1, and TMA7 also dependent on HPF1. These experiments should be done in order to demonstrate that serine ADP ribosylation is the major fraction of ADP ribosylation after DNA damage. 3) What are the 'readers' of Ser-ADPr? This is referenced in the penultimate paragraph of the Results and Discussion section, but it is not clear what proteins carry out the specific reading of Ser-ADPr. A reference would be helpful here. The "erasers" of Ser-ADPr are more clear since the ARH3 enzyme is implied. It would be great to use ARH3 enzyme (as has been done in the previous eLife paper) to validate ADP-ribosylation on serine next to hydroxylamine (validating ADPr on Glu/Asp) in Figure 2. 4) The use of wild-type and S6A histone H2B is a nice example of specific ADPr modification, and there are not many examples in the literature specific ADPr sites confirmed in vivo. Are there other examples (e.g. other histones) that could be included in this study to solidify the technique and add important confirmed sites to the literature? 5) It is interesting to see that the level of basal/untreated ADP-ribosylation is often (at least on the used cell extracts) more than the levels detected upon recovery from DNA damage. Could the authors comment on this phenomenon? Also, while the study focuses on DNA damage-induced ADP-ribosylation, are you able to address which residues are predominantly modified in the untreated cells? In summary, all reviewers were very favorable and kindly ask for the 4-5 points raised to be addressed. 1) The authors state that the major fraction of ADP-ribosylation occurs on serines after DNA damage. To substantiate the findings in Figure 3 that shows HPF1-dependent serine ADP-ribosylation of H2B, the authors should test whether knockout of HPF1 indeed abolishes serine 6 ADP ribosylation in vivo using MS.
We already addressed this point in our previous publication (Bonfiglio et al., 2017a). We showed that the ADPr on Ser6 of H2B is dramatically reduced (∼200-fold) in cells lacking HPF1 (Bonfiglio et al., 2017a; Figure 1F-G). To what extent does Glu/Asp become the main ADP-ribose acceptors in the absence of HPF1? H2B does not appear to become ADP-ribosylated at all in the absence of HPF1, while PARP1 does. Is there any unbiased study addressing this switch in target residues? There is no unbiased study yet that would investigate in cells the switch in target residues from serines to glutamate. However, in our previous publication (Bonfiglio et al., 2017a) we have performed an unbiased mass spectrometric analysis of in vitro ADPr reactions addressing the switch in target residues on PARP-1 itself. In the current manuscript, our data show that the majority of ADPr under both basal and DNA-damage stimulus happens on Ser residues and that most of Ser-ADPr is lost in the absence of HPF1 (new Figure 2C and D). Without HPF1 PARP1 is automodified significantly on the acidic residues and the average chain length substantially increases, while we cannot detect significant glutamate ADPr on histone in the same conditions. This is not surprising, since in the absence of HPF1 histone ADPr is effectively lost (while PARP1 becomes hyper-PARylated), as previously shown by us (Gibbs-Seymour et al., 2016). Our previously published in vitro data (Bonfiglio et al., 2017a) showed strict HPF1-dependence of Ser-ADPr for all the core histones, HMGA1 (S8 and S9) and HMGN1 (S7) by using high-resolution ETD MS/MS analysis. ADPr of those target proteins was HPF1-dependent. In the same publication, we also showed that Ser-ADPr is lost on H3, H4, H1 and PARP1 in HPF1 KO cells. The “readers” of Ser-ADPr are not known at the moment (we are sorry if our text was misleading, we have rewritten it) and this is another exciting area to explore in the future. We have performed the requested experiment (see Author response image 1) and we noted that ARH3 removes the ADPr signal from both the wildtype and the HPF1 KO samples. This is not surprising, considering that it is well known that ARH3 removes poly-ADPr chains and that the absence of HPF1 leads to hyperPARylation (formation of very long chains of ADPr largely on PARP-1 itself), as shown by us previously (Gibbs-Seymour et al., 2016). In fact, treatment with PARG, which removes polyADPr without removing the terminal unit of ADPr, gives identical result in HPF1 KO samples (last lane). The complete loss of the ADPr in the HPF1 KO sample with either PARG or ARH3 might be surprising in the first instance. However, it is important to keep in mind that ADPr polymers can be extremely long (up to 200 units). Thus, by assuming that the average ADPr polymer contains 100 units of ADPr, the amount of ADPr that remains after the treatment with either ARH3 or PARG would be two orders of magnitude lower. Based on our experience with the anti-pan reagent, which is not very sensitive, it does not surprise us that this amount of ADPr does not give any detectable signal. In control cells, however, the amount of mono-ADPr seems to be a lot higher (with many more different sites modified), as supported by the PARG treatment experiment, therefore the ADPr signal is still detected. We have performed this experiment for the reviewers, but we have decided not to include it in the manuscript, as the interpretation of this blot is very complicated (especially for non-specialist readers) and can, therefore, lead to misunderstanding of our message. We have now used the same technique to confirm the in vivo Ser-ADPr sites for H3 which worked perfectly (new Figure 4). The results fully support the previous data, and demonstrate that most of the main acceptor sites of ADPr on H3 is on Ser10 position and that there is also some ADPr targeting Ser28 (new Figure 4B). Ser10 and Ser28 are the only ADP-ribosylation sites on histone H3 identified in our previous study (Leidecker et al., 2016) and the mutation of both residues completely abolished ADPr of histone H3 (new Figure 4B). In addition, this result shows that our technique will be very useful for the confirmation of in vivo ADPr sites for different proteins. 5) It is interesting to see that the level of basal/untreated ADP-ribosylation is often (at least on the used cell extracts) more than the levels detected upon recovery from DNA damage. Could the authors comment on this phenomenon? The cells not treated with the exogenous damage still experience damage from the endogenous sources including replication related stimuli. The fact that ADPr signal is often higher in the untreated samples than in the post-treated samples is likely due to upregulation of hydrolases in response to high doses of DNA damaging agents (as for example documented for PARG, which actively translocates to the nucleus upon DNA damage). Also, while the study focuses on DNA damage-induced ADP-ribosylation, are you able to address which residues are predominantly modified in the untreated cells? We have performed the experiment and as shown in new Figure 2C, serine residues are the residues predominantly modified even under basal condition. Ahel laboratory is funded by the Wellcome Trust (grant 101794), Cancer Research UK (grant C35050/A22284), and the European Research Council (grant 281739). The work in Matic laboratory was funded by the Deutsche Forschungsgemeinschaft (Cellular Stress Responses in Aging-Associated Diseases) (grant EXC 229 to IM) and the European Union’s Horizon 2020 research and innovation program (Marie Skłodowska-Curie grant agreement 657501 to IM). Luca Palazzo received a fellowship from the Italian Foundation for Cancer Research (FIRC, Milan, Italy; grant 14895). We are grateful to Ian Gibbs-Seymour for providing cell lines and advice, Juan-José Bonfiglio for discussions and Kai Heydenreich for help with cell culture experiments and western blotting. We would like to thank Johannes Rack and Edward Bartlett for the helpful comments on the manuscript. © 2018, Palazzo et al. ADP-ribosylation (ADPr) is a posttranslational modification (PTM) of proteins that controls many cellular processes, including DNA repair, transcription, chromatin regulation and mitosis. A number of proteins catalyse the transfer and hydrolysis of ADPr, and also specify how and when the modification is conjugated to the targets. We recently discovered a new form of ADPr that is attached to serine residues in target proteins (Ser-ADPr) and showed that this PTM is specifically made by PARP1/HPF1 and PARP2/HPF1 complexes. In this work, we found by quantitative proteomics that histone Ser-ADPr is reversible in cells during response to DNA damage. By screening for the hydrolase that is responsible for the reversal of Ser-ADPr, we identified ARH3/ADPRHL2 as capable of efficiently and specifically removing Ser-ADPr of histones and other proteins. We further showed that Ser-ADPr is a major PTM in cells after DNA damage and that this signalling is dependent on ARH3.